Reader Tim Campbell, a Canadian, is struggling to understand what the copyright implications are when an older work is incorporated into a newer work. • A Canadian author wrote a two volume history of a town and its inhabitants. The first volume was published in 1895 and the second volume in 1896. The author then died in 1901. • In 1972, a second Canadian author published a history of the same town. He incorporated all of the first author’s work plus additional material. • The second author’s book was reprinted in 1978 and 1984. Here’s the question: what’s the copyright status of the first author’s books now that they’ve been incorporated into the second author’s book? Great question. And the answer isn’t going to be a whole lot different between Canadian law and American law so we can all benefit from it. In both Canada and the United States, copyright protection is time-limited. Once a specific number of years have passed after a key event — in this case, the death of the author since we’re talking solely about published works — all copyright protection ends and the work itself passes into what’s called the public domain. So… in either country, anything published is going to become public domain — free for everyone to use without permissions or licenses — and the only difference is when. In this particular case, since the first author died in 1901, the very latest the two original volumes became public domain would be 1971 (under U.S. law) and 1951 (under Canadian law). But what happened to the public domain status of those earlier books when they were republished, and incorporated into the later book? The answer — under both U.S. and Canadian law — is simple: nothing. The copyright in a derivative work covers only the additions, changes, or other new material appearing for the first time in the work. Protection does not extend to any preexisting material, that is, previously published or previously registered works or works in the public domain or owned by a third party. Canadian law doesn’t use the term “derivative work” but instead would regard this as part of a compilation. And, as to compilations, the law is clear: “The mere fact that a work is included in a compilation does not increase, decrease or otherwise affect the protection conferred by this Act in respect of the copyright in the work.”6 In other words, adding public domain material into the new work didn’t change the public domain character of the older works. 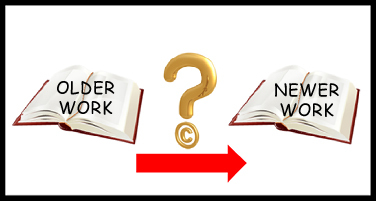 What is copyrighted in the new work? Anything added by the authors or editors. A foreword. An additional essay or photo or image. A discussion or analysis that wasn’t in the old work. In short — everything that was created or added by the new work, including the specific organization and selection of materials to be included. For example, if I take 20 poems out of the 200 written by a poet who died more than 70 years ago and arrange them in a particular way, I can get protection for that arrangement and it can’t be copied. But the original work that was in the public domain? It’s still there, in the public domain. With my usual caveats about this not being legal advice,7 I can tell you that, in your shoes, I’d go for it, Tim. Republication didn’t move those older works out of the public domain by so much as a millimeter north of the border or an inch south of the border. Really excellent post, Judy. Because I’m both an author and historical researcher I get questions like this a lot. I can now direct them to this URL. Thanks for the kind words, Stephanie! Thanks for a great article. In your example can I copy each poem from the new book? I wouldn’t copy from the new book. I’d copy from the original, public domain book. Things like font type, layout, and the like might be considered part of the organization of the new work and I wouldn’t want to get within a country mile of that. Typography is not protected by copyright in the US, though it is on some other countries. So, you CAN copy from a recently-set edition of a PD work published in the US. Glad to hear that typography wouldn’t be covered, but I’m not taking chances. Judy, you are of course right on target with this response. In US law, it is spelled out in 17 USC 103(b). But one slight amplification: You write “In this particular case, since the first author died in 1901, the very latest the two original volumes became public domain would be 1971 (under U.S. law).” That would be true if the life +70 term applied to works published in 1895 & 1896, but it only applies to works published after 1977. Canadian volumes published in 1895 and 1896 could secure copyright protection in the US, thanks to the Chase Act that was passed in 1891. (Prior to that, there was no US copyright protection for foreign works.) US law, however, had a rigorous set of formalities. The work had to be published with copyright notice, renewed after 28 years, and most of all, be manufactured in the US. It is very unlikely that a Canadian local history complied with these requirements. It is almost certain the work entered the public domain in the US upon publication. But if the work did comply with US formalities, the longest copyright could have endured would be 56 years after publication (28 year initial term and 28 year renewal term). So the very latest that the two volumes could have been protected in the US would be 1951 and 1952. I keep forgetting that the later statutes weren’t retroactive, Peter. Thanks so much for the clarification! I may have misread something, but if the work was published before 1922 it would be in the public domain regardless of when the death of the author occurred. Is there a different date in Canada? There is, yes. But as Peter Hirtle reminded me, calculations of the dates need to take into account the changes in the copyright law through the years. Today I started adding my family tree info to the Family Search site. I wanted to add a copy of a marriage cert, but wondered if I had the right. I got the image from a microfilm ordered from a FHC of the LDS church, so I don’t see a problem putting it on their site. But what if I got if from a State archive directly? By continuing with the upload process, you confirm that you have the right and/or permission to share any images or documents you submit, and you agree to the terms and conditions of the FamilySearch Content Submission Agreement. You also acknowledge that any images or documents you upload become part of the collection hosted by FamilySearch.org, which is publicly viewable and accessible by anyone online. You will be able to remove images and documents you have contributed to FamilySearch.org, but FamilySearch.org is under no obligation to monitor or inhibit the use of contributed images or documents by others. Currently we support JPG, PNG, and PDF files. As with many things in law, it depends. I wouldn’t be so sure that you can attach the copy from the LDS microfilm–it depends what their agreement was with whatever government issued the certificate. (I know their agreement with the Irish government, and with the city of Philadelphia government, as just two examples, prohibits them from putting certificate images online on public pages.) As for the certificate you got directly from the state, it depends what your agreement was with the archive or agency from which you got the certificate. In both cases, this is a matter of contract law, not copyright law.